You can see this garden from Saint George Castle, from Nossa Senhora do Monte viewpoint, from Graca Convent Viewpoint… I remember seeing this green area many times before, from all these places. I always thought it would be a nice place, if only it was a garden opened to the public. And one day, it was!!! It was opened for public pleasure two years ago. It’s a simple, yet wonderful garden, due to the privileged views one can have from there. 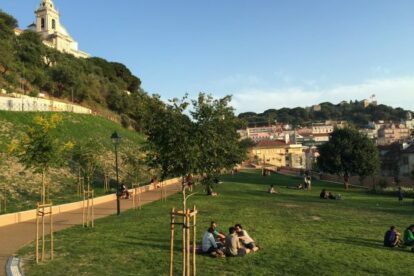 Just sit on the belvedere and watch the sunset over the 25 de Abril bridge and Tagus river or gaze out at the Castle, or go for a walk by the lane and appreciate Mouraria and Graca Convent. It has 3 entries, all quite hidden. One is from the Graça Convent, to the left of the viewpoint, through the stairs. The other is on the other side of the convent, by calçada do Monte. And the third entrance, or exit, is from/to Mouraria. It has a nice cafe with an esplanade, the belvedere, alane and a picnic area. It took me a long time to write about this garden because it went through some maintenance works. And now that it’s all done, I’m very proud of writing about it: the biggest green area inside the historical zone.